Will Zelda Wii U look like Wind Waker? Remember that really stunning Zelda demo that was showcased at E3? How could anyone forget the beautiful demonstration. Not long after that Feld0 reported that Miyamoto had confirmed that a Zelda game would be coming to the Wii U. But those thinking that the finished game will be akin to that gorgeous demo at E3 might want to think again as Zelda producer, Eiji Aonuma has put across the idea that it might not look like that at all. This won’t come as too much of a surprise as Nintendo did repeatedly stress that the video demonstrations that they showed were not representative of real games. He also went on to say that the demo shown was just an experiment to see what Zelda would look like in HD and to test out the Wii U graphics. This suggests that the final Zelda game could be something quite different. Personally, I wouldn’t mind cel-shaded, Wind Waker type graphics but I can’t help wanting the art style and visuals we saw at E3. In all honesty, and after reading a comment on another site, it really doesn’t matter so much on the great graphical systems they make go along with the game, as long as they make the story system on par with previous Zelda titles everyone should be happy. Whether it be a sequel or a prequel, as long as everything in it feels like a Zelda title then all should be good. I wouldn’t mind if it was Cel-shaded or realistic, Wind Waker is my favourite game of all time. Since Skyward Sword was kinda Cel-shaded, it’s more likely it will be realistic like Twight Princess. I doubt Nintendo will make to Cel-shaded Zelda games in a row. I hope that the game looks and plays fine, no matter the style. Maybe make 2 games (one Cel-shaded and one Demo style graphics). Feld0, I’m really surprised at how sensationalist of a headline you used. The story here is about a potential for a different visual style, but nowhere in that interview was it said that they’d be using a Wind Waker Cel Shade look. They may even only be teasing us here and only slightly alter what we saw @ E3 2011, and then you’d look quite foolish. Then again, there could be a drastic departure. I just think it’s incredibly closed-minded to assume a game has to be either “cel shaded” or “realistic.” There are many artistic styles for them to choose from, and I’d like to see what can be done with them. If you’ll look at the article about this on My Nintendo News, I left a lengthy comment detailing 3 potential styles that could make for an interesting Zelda visually. I would like to clarify that I do believe the game itself is what’s important, but I don’t think it could hurt to have a memorable visual style along with that. Oh. My bad. I forgot the site is outsourcing. :p Sometimes my mind goes back to the old system and immediately goes to Feld0. I understand what you’re saying, It could be realistic, it could be cel-shaded it could be neither. Cel-shaded was used as an example so I used it as my example to see what people thought if Nintendo did decide to use a different art style from that used in the demo. I also used ‘could’ a possibility verb. Before you go calling people foolish maybe you should check who has actually written the article. Youre the one who looks foolish. Also I would like the artstyle from the demo. That E3 video was amazing to see, and I do believe it needs to be used. I just don’t want it for every game, as I’m interested in the visual reinterpretations. The game is what counts, of course, but I’m only speaking from a presentation standpoint. If they would return to this style and update it every couple of games or so, that would be perfect. Most likely that look would be the first on a new system, and that would allow it to be a graphical showpiece. I’m a lifelong Nintendo fan. My earliest game memories include The Legend of Zelda. Link’s always been my homeboy. For nearly 20 years, I’ve loved nearly every direction the Zelda series has taken, overriding sleep many nights with pure gaming pleasure. I’ve watched over the years how a single quest can be original, engaging, and just plain artistic in so many ways. Truly, The Legend of Zelda is my favorite game series ever. 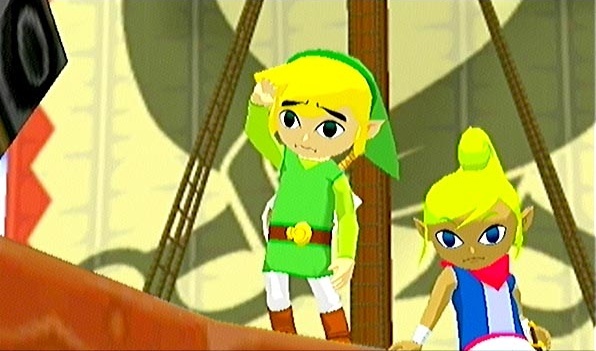 Don’t get me wrong–I LOVED Wind Waker. It’s probably my third favorite Zelda game, behind Twilight Princess and Ocarina of Time. But if they just do another Wind Waker, that’d be quite disappointing for me, especially since I don’t think anything else can TOP Wind Waker for what it was. Even though Eiji really didn’t make any indication of a new Wind Waker being the case for Zelda HD, still, just him indicating that we may not get what we saw with the short but sweet demo is quite heartbreaking. I’ll have to wait and see what they DO deliver, but it’s going to take a surprisingly good move to make me feel different. I say, just stick with the Zelda more like what you showed us, Eiji! But..(sigh)…I’ll wait and see what they’ve got up their sleeves. That`s Nintendo for ya, lately. Get people excited for what looks to be the best looking Zelda game ever and pretty much pee on the idea. I`m really startin to hate some of the crap they`re pulling. That Eiji guy is really startin to be a wet blanket. I love seeing all the wiiu blog folks over hear. Oh, yes!!! I love me some Wind Waker Graphics!!! I’d be fine with realistic graphics, too. Why do we assume the graphics would be cel-shaded? All they said was that the final game did not necessarily reflect the demo they presented; they never said it specifically had to be cel-shaded. Yet another dichotomous mentality on the rise here: Cel-shaded or Realistic. It’s not an either/or situation. Well, Skyward Swords is BOTH cel-shaded and realistic, so maybe we could look at that as an example of a beautiful compromise. I was hoping they get early confirmation of them going strongly into that style we saw with this game. Since Nintendo HAS been experimenting a lot with Zelda–some fun titles, but nothing of grandeur like Ocarina of Time or Twilight Princess–I’ve been concerned of it losing its edge lately, an edge that I think that Zelda HD demo brought back! I don’t want to have to wait for presumably a next Zelda game on Wii U to experience with this Zelda game for Wii U. I say, save experimental stuff for the next game–give us that what we saw! That’d not only bring some grandeur and edge to the series, but it’d make a lot of “core” gamers check Wii U out like a Japanese girl in a short mini skirt! Their not taking advantage of the 1080p.. They should stick to the demo version. I’m hoping for an 8-bit game for the next Zelda, anybody else? no one actually said wind waker graphics did they hhhmmmmm..